In the UK we’re currently celebrating the 100th anniversary, on 6 February 1918, of the Representation of the People Act by which at least some women were granted the right to vote. I’ve written before about Shakespearean links with the suffrage movement here in Stratford. The most notable example of a woman being disenfranchised is Elisabeth Scott. 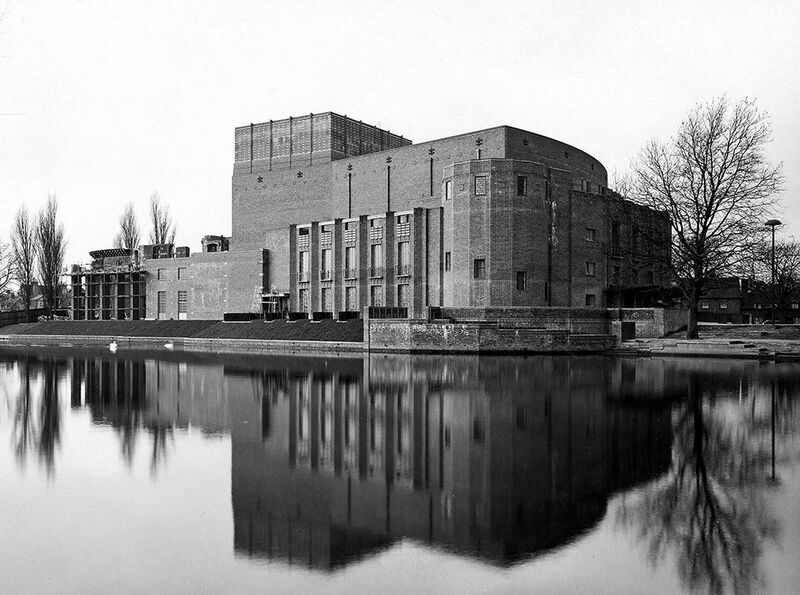 In spite of being a qualified architect and in January 1928 winning the competition to design the Shakespeare Memorial Theatre in Stratford-upon-Avon, she was still too young to vote. This was only changed when in July 1928 , the Representation of the People (Equal Franchise) Act gave the vote to all women over 21 on equal terms with men. She went on to develop her plans and to oversee the project, the first important public building to be designed by a woman, that opened in April 1932. Scott was a quiet pioneer whose role has often been downplayed, but surely her major achievement deserves a memorial within the Theatre that is still a monument to her. Stratford-upon-Avon was an old-fashioned place in the early twentieth century, but the suffrage movement received a lot of support in the town. This link leads to another post that talks about some of the events. Most publicly, many of the leading actors in the Shakespeare Festival were members of the Actresses’ Franchise League, and a branch of the Women’s Suffrage Society was formed here as early as 1907. Suffragists and suffragettes including members of the acting company, regularly took place in the Shakespeare Birthday Celebrations for a number of years. Just a month after Emily Davison was killed at the 1913 Epsom Derby a march of suffragettes came through Stratford, holding a public meeting in Rother Market. The meeting was not trouble-free, with speakers being heckled and supporters jostled. The vicar spoke up for the suffragettes: ““whether we agree with their views or not, [they] are peaceable citizens and entitled to that free speech, which, within the rights of the law, is the birthright of every Briton”. 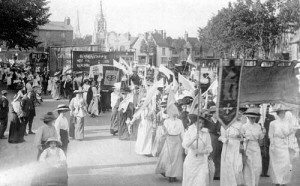 Stratford also had its home-grown supporters of the suffragette movement. One of them was Kathleen Scriven. Without any qualifications or professional connections she became in important figure in the town’s Shakespeare Club. Women had only been admitted as members for a couple of years when she joined the Club in December 1902. She came from the same class of people who had originally formed the Club as her husband Edgar Scriven was a coal merchant living in Tyler Street. Kathleen Scriven didn’t just attend meetings but in spite of her lack of any qualifications contributed a number of talks to the Club’s programme. Her first , in November 1904, was Shakespeare’s Allegory in Folklore. Rather than applauding her effort, the Stratford-upon-Avon Herald reported it condescendingly: “Scriven’s paper was almost entirely subjective in character, treated mainly of abstract affairs. This may be a good way or it may not, it may have merit, or it may have grave demerit, but at least, all is left to the sole arbitrament of the audience and each may judge of it as he or she will’. Later talks were on the three parts of Henry VI (read by Lilian Hartley in May 1906), on Henry IV Part 2 (April 1913) on Macbeth (April 1921) and Notes on Stratford-upon-Avon before Shakespeare’s Time (1920). 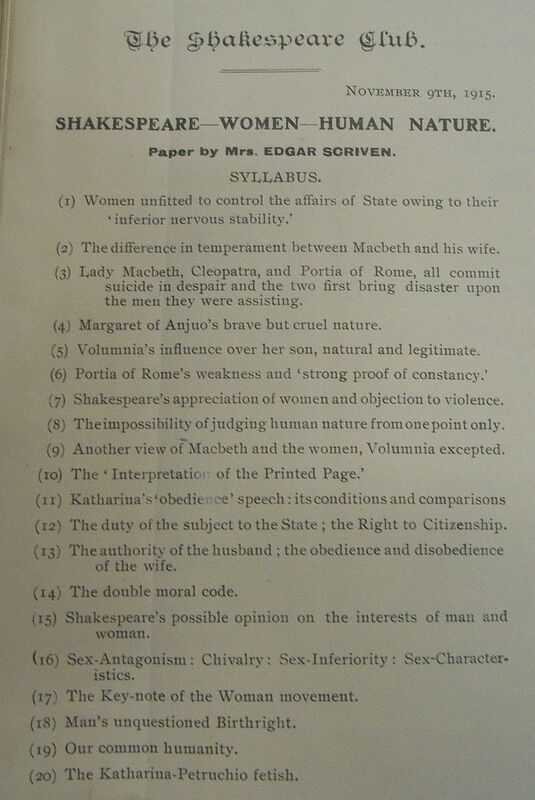 The most controversial of her talks was given in November 1915 with the title Shakespeare – Women- Human Nature. The paper was reprinted in full in the Stratford-upon-Avon Herald on 16 December which described it as ‘exhaustive’. 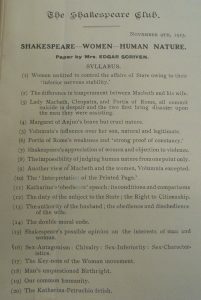 Arguing that Shakespeare would not have denied women’s claim to full citizenship, Scriven was ‘heartily applauded’ by the audience and it was resolved that a precis of her ‘very clever and well worked out paper’ should be distributed to all Club members. In 1918 she was the first woman to be elected to the Club Committee, and later on suggested that the Club should work with schools. 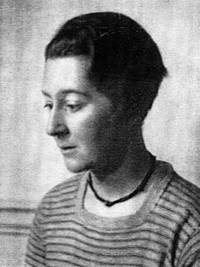 She resigned from the Committee on 1927 and retired from the club in 1935, three years before she died at the age of 80. Her story, and those of a number of other women who have made a major impact on the Club, is told in the Story of the Shakespeare Club of Stratford-upon-Avon 1824-2016. This entry was posted in Legacy, Stratford-upon-Avon and tagged Elisabeth Scott, Kathleen Scriven, Shakespeare Club of Stratford-upon-Avon, Shakespeare Memorial Theatre, suffragettes. Bookmark the permalink.